Trying to serve two masters, or...? 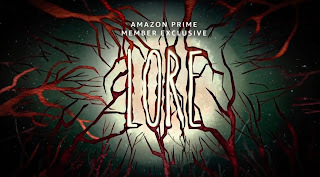 I haven't listened to the Lore podcast, so going into the Amazon TV adaptation, I had a totally open mind and very few expectations. But it sounded like something that would be right up my alley — a look at the true stories and origins of a wide variety of horrors and beliefs, many of which were held in the shockingly recent past. I'm the kind of person who enjoys reading about the real Vlad Dracula more than I enjoy Bram Stoker's tedious novel, and the kind of person who generally enjoys The Crucible more than, say, The Witch and other tales hinting at supernatural evils in the forest. From the description provided by Amazon, I thought this was going to be a look at the real monsters (hint: it's us!) behind many of the misdeeds attributed to made-up monsters. In form, Lore is pretty interesting. It's probably about as faithful an adaptation of a podcast as you could make for TV. 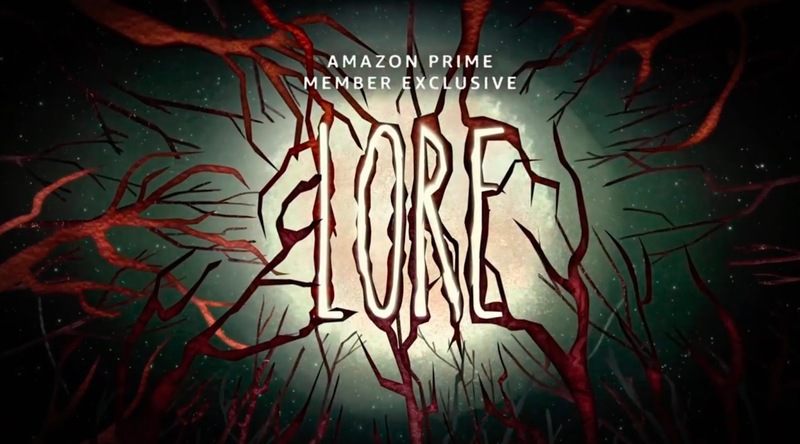 In each episode, a combination of strong visual design and graphics underneath narration from the show's creator and host, Aaron Mahnke, is paired with a live action re-creation of some singular story relating to the topic. As a rule, I found the narrated portions more involving than the re-creations, even though there are some great actors involved, and — it must be said — portions that are legitimately hard to watch, even without being particularly gory. Campbell Scott, for instance, must watch his daughter be exhumed and her chest cracked so that her heart and liver can be extracted and burned. That's pretty grim. Colm Fiore plays Dr. Walter Freeman, who gives patients — including children! — ice pick lobotomies in his comfortable office. It's hard to watch, but I never found it engaging. I couldn't put my finger on why, exactly, until I got to the episode "The Beast Within," about werewolves. At the end of the Campbell Scott episode, "They Made a Tonic," the show absurdly suggests that the death and exhumation of Mercy Brown was the inspiration for Stoker's Dracula novel. I've read that some people suggest Stoker may have loosely based the character of Lucy on Mercy, but who knows? The claim the show made felt way, way overblown, and kind of put me back on my heels. By the time I got to "The Beast Within," I had started to think that type of overreach was a feature, not a bug, of the show. In the werewolf episode, the re-enactment focuses on the story of Peter Stubbe, a 16th century German farmer publicly executed for his crimes committed as a werewolf. While it's impossible to know what really happened in the German village of Bedburg over 400 years ago, and it's possible that Peter Stubbe actually was a killer, and not simply a vessel for superstitious people and power-hungry religious leaders during a time of war and political upheaval to pour their suffering into, he certainly wasn't a werewolf. His Wikipedia page is more interesting than the re-creation presented in Lore, in which Stubbe isn't a farmer, but some type of town elder, who is apparently crazy and has been waiting a dozen years to kill the daughter of one of the townspeople and just biding his time. The result is a weak, not-scary twenty-minute period horror movie, that bears only a passing resemblance to the real-world events. And that, I thought, was the hook of the show. looking at the real-world events that have passed into, well, lore. So it left me flat. I felt like it was somehow trying to be scholarly (or pseudo-scholarly) and also exploitative or titillating, and it wound up not doing either one particularly well. Posted by Vance K — cult film reviewer and co-editor of Nerds of a Feather since 2012, and person who will one day, really, write that vampire and werewolf story he's been stewing over forever.